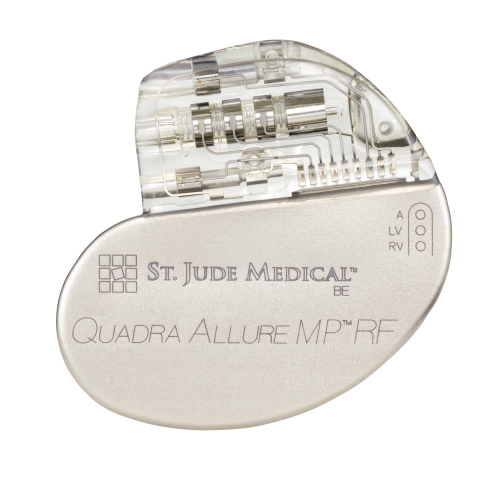 St. Jude Medical, Inc. (NYSE:STJ), a global medical device company, today announced CE Mark approval for magnetic resonance (MR) conditional labeling for the company's Quadra Allure MP™ cardiac resynchronization therapy pacemaker (CRT-P). The Quadra Allure MP CRT-P, with its first-to-market MultiPoint™ Pacing technology, now offers patients the flexibility to undergo full-body diagnostic magnetic resonance imaging (MRI) scans of up to 1.5 Tesla (measurement for the strength of a magnetic field) for other conditions. "As a clinician, I want to offer my patients an advanced cardiac pacing technology that also reserves the option for them to safely undergo a full-body MRI at some point in the future if it's needed," said Prof. Georg Nölker, Head of the Electrophysiology, Heart and Diabetes Center NRW at Ruhr-University of Bochum, Germany. The Quadra Allure MP CRT-P with MRI labeling is designed to work with the Quartet™ LV lead, which has four electrodes to offer maximum flexibility for different pacing configurations to help manage heart failure patients. Despite advances in quadripolar pacing technology, non-responders to CRT therapy continue to be a clinical concern. The MultiPoint Pacing technology has been shown to enhance patients' response to CRT. The technology allows physicians the opportunity to capture more left ventricular tissue quickly by delivering pacing pulses to multiple left ventricle locations rather than the traditional single pulse for each heartbeat. "The Quadra Allure MP is the only CRT-P with MultiPoint Pacing technology, MRI full-body labeling, and more clinical options to treat patients who don't respond to initial pacing therapy. This new technology allows patients who have heart failure that is challenging to manage to receive more effective therapy and still be able to get an MRI for other medical conditions if needed," said Dr. Philip B. Adamson, vice president and medical director of global research and development at St. Jude Medical. Multiple clinical trials, including a recent study, demonstrate that MultiPoint Pacing technology may be particularly beneficial in patients not responding to traditional bi-ventricular pacing therapy, which accounts for approximately one third of the total population of patients receiving CRT. With more options to treat patients who don't respond to CRT, the clinician can reduce the rate of CRT non-responders and reduce the likelihood of costly lead revision through a second intervention procedure. The new Quadra Allure MP CRT-P with MRI labeling is also compatible with the SyncAV™ CRT software, designed to build upon the MultiPoint Pacing technology and further optimize St. Jude Medical's comprehensive CRT portfolio. The SyncAV CRT technology, which automatically adjusts pacing based on real-time changes in a patient's cardiac condition, also provides physicians the opportunity to further improve treatment of patients who have responded positively to traditional CRT. Quadripolar technology offers physicians more options to manage heart failure and facilitates additional pacing configurations within the heart that offer physicians options not available in traditional bipolar systems. While the Quadra Allure MP CRT-P with MultiPoint Pacing and SyncAV CRT technology is approved in the U.S., the company continues to work toward approval for MR-conditional labeling. Approximately 23 million people worldwide are afflicted with congestive heart failure and 2 million new cases are diagnosed worldwide each year. Studies have shown that CRT can improve the quality of life for many patients with heart failure, a progressive condition in which the heart weakens and loses its ability to pump an adequate supply of blood. CRT resynchronizes the lower chambers (ventricles) of the heart by sending uniquely programmed electrical impulses to stimulate each ventricle to beat in sync for optimal cardiac performance. St. Jude Medical is pioneering heart failure disease management with innovative solutions like the CardioMEMS ™ HF System, ground-breaking quadripolar technology and, in select European markets, the HeartMate 3 ™ left ventricular assist system and our first-to-market MultiPoint ™ Pacing technology. St. Jude Medical collaborates with heart failure specialists, clinicians and advocacy partners to provide a comprehensive product portfolio that includes innovative, cost-effective solutions that help reduce hospitalizations and improve patient quality of life for heart failure patients around the world. St. Jude Medical is a leading global medical device manufacturer and is dedicated to transforming the treatment of some of the world's most expensive epidemic diseases. The company does this by developing cost-effective medical technologies that save and improve lives of patients around the world. Headquartered in St. Paul, Minn., St. Jude Medical employs approximately 18,000 people worldwide and has five major areas of focus that include heart failure, atrial fibrillation, neuromodulation, traditional cardiac rhythm management and cardiovascular. For more information, please visit sjm.com or follow us on Twitter @SJM_Media.